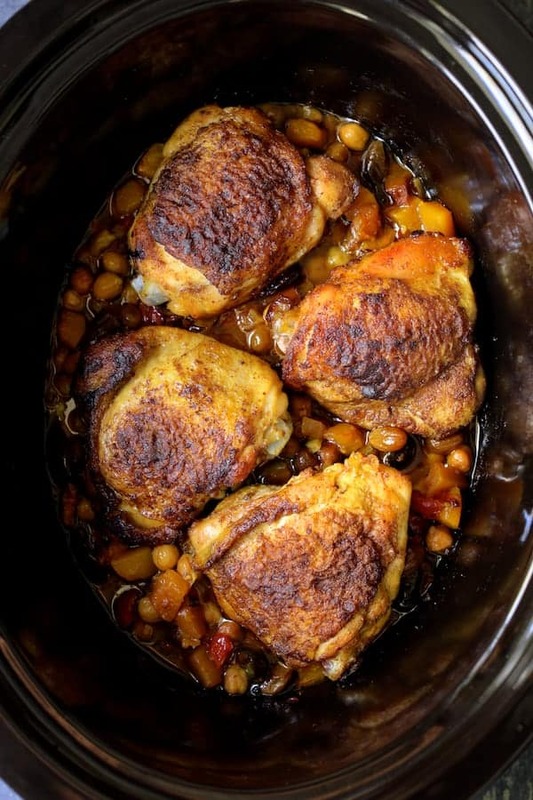 Moroccan Chicken Tagine with Butternut Squash, Chickpeas and Olives is a lovely, budget-friendly, low-stress exotic dinner you’ll love coming home to or serving to guests! …And it’s also Progressive Eats time, our virtual progressive dinner party! Read on for more amazing squash recipes! Hey, friends! It’s that slow-cooker time of year! I’ve got a super-easy and budget-friendly dish you’re going to love! 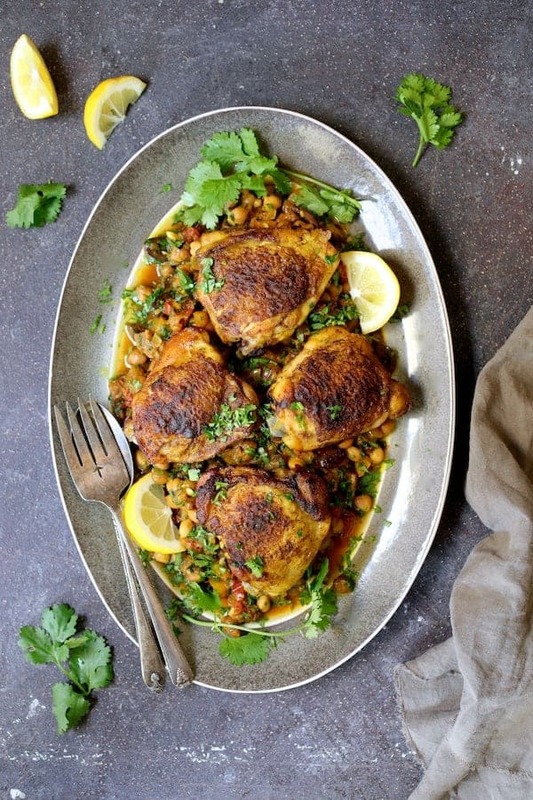 Moroccan Chicken Tagine with Butternut Squash, Chickpeas and Olives! Now, I’ve clearly got a butternut squash thing happening in my life right now but we have about a bushel of it in our pantry so please stay with me! And who doesn’t love a creative butternut squash recipe? 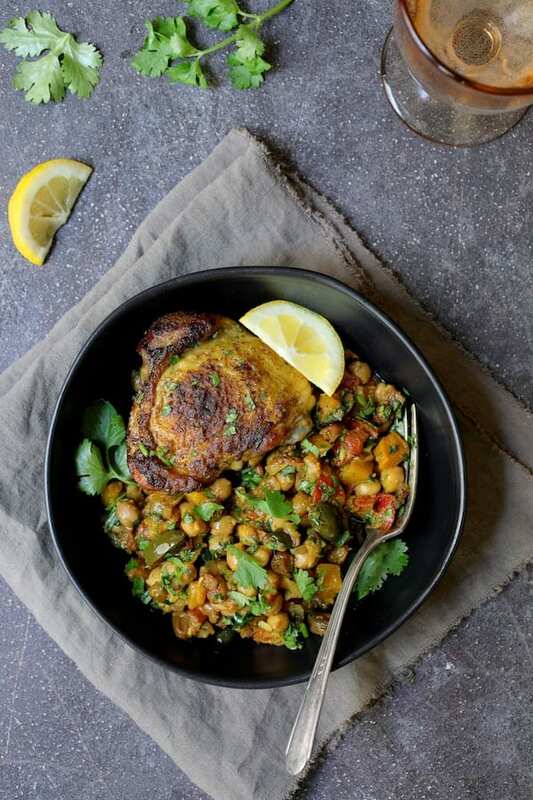 This Moroccan Chicken Tagine with Butternut Squash, Chickpeas and Olives has got it goin’ on! A tagine sounds exotic but it’s really only the Moroccan version of a slow cooker. A tagine is both a dish and a cooking vessel. The cooking vessel has a conical shape which is meant to preserve every single drop of precious moisture in a climate with very little moisture. Steam from the dish collects on the sides of the tagine then drops back down to continue the slow cooking process. The same thing happens in a slow cooker! Start by combining the vegetables, chickpeas and olives at the bottom of the slow cooker. Combine the spices in a small bowl and sprinkle half on the chicken thighs. Brown the chicken thighs well then place on the vegetables. Stir the remaining spice mixture into the vegetable combination. Set the slow cooker on High for 4 hours or Low for 8 hours and let it go! Add cilantro, place it on a platter, garnish and look like a global culinary superhero! That’s it! If you add the olives near the end, they’ll keep their beautiful black color. However, I put them in at the beginning and I think they added more flavor to the whole dish. Be sure to try my other Moroccan-inspired dishes! …And with that, it’s Progressive Eats time! It’s our virtual version of a Progressive Dinner Party. This month features a bunch of recipes for winter squash and one for a perennial favorite of summer squash that’s good to have in your back pocket all year long. Our host this month is Susan who blogs at The Wimpy Vegetarian. If you’re unfamiliar with the concept, a progressive dinner involves going from house to house, enjoying a different course at each location. With Progressive Eats, it’s a virtual party. A theme is chosen each month, members share recipes suitable for a delicious meal or party, and you can hop from blog to blog to check them out. Come along and see all of the delicious squash dishes we’ve put together for you! 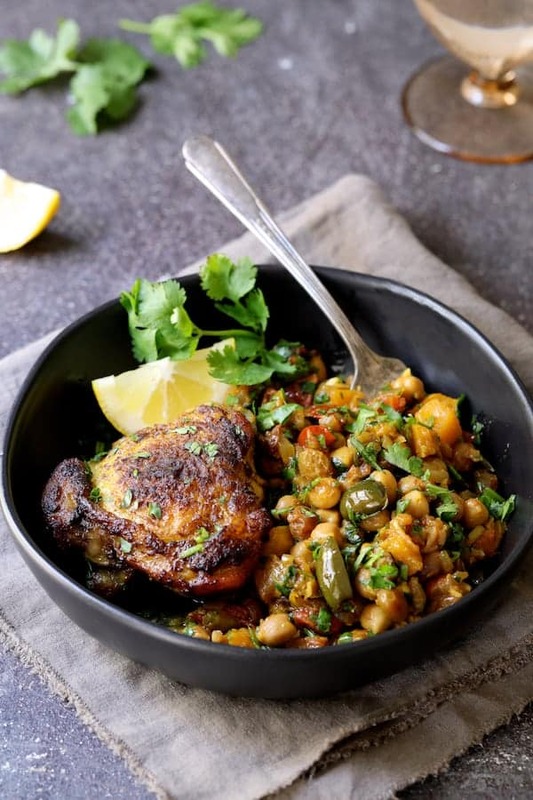 Moroccan Chicken Tagine with Butternut Squash, Chickpeas and Olives – From A Chef’s Kitchen YOU’RE HERE! 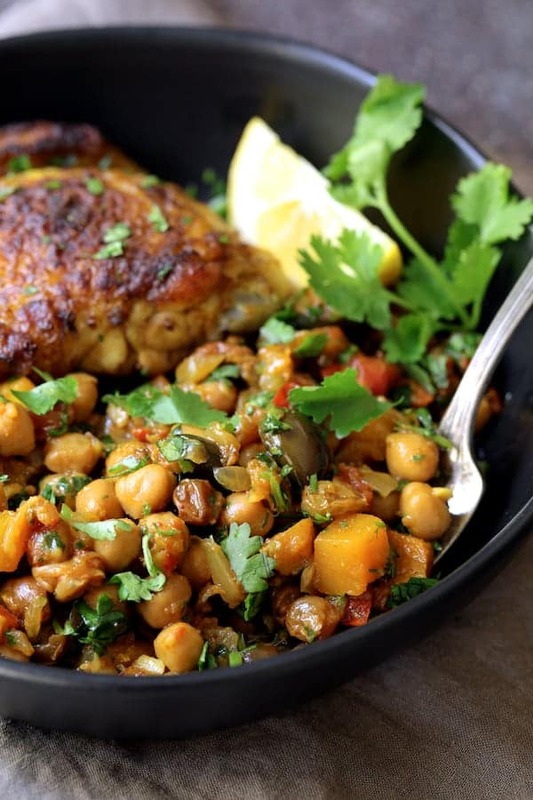 Moroccan Chicken Tagine with Butternut Squash, Chickpeas and Olives is lovely, budget-friendly, low-stress exotic dinner you'll love coming home to or serving to guests! Combine first 8 ingredients in the bottom of a slow cooker. Combine coriander, cumin, ginger, turmeric, salt, cinnamon and cayenne in a small bowl. Heat olive oil over medium-high heat in a nonstick skillet or saute pan. Sprinkle approximately half the spice mixture over the chicken thighs. Stir the remaining spice mixture into the butternut squash/chickpea combination. Place chicken thighs in hot oil then brown well 6-8 minutes. Turn over and brown the other side in the hot, spicy fat for another 3-4 minutes. 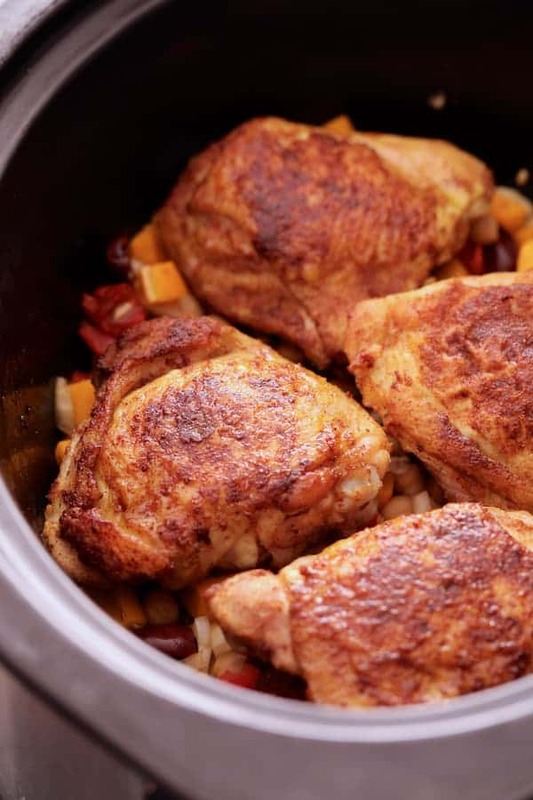 Place chicken thighs in the slow cooker and pour any accumulated fat from the skillet into the slow cooker. Stir chopped cilantro into butternut squash/chickpea combination. 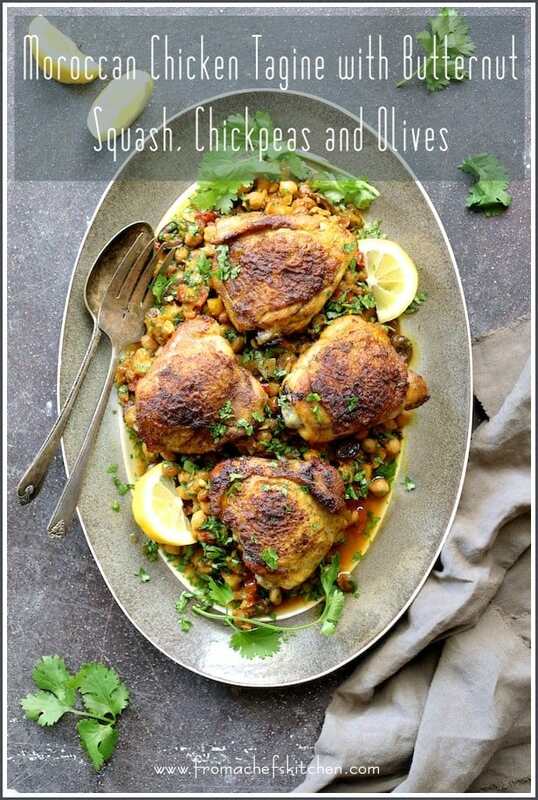 Place butternut squash/chickpea combination on a platter, top with chicken and sprinkle with cilantro. Garnish with cilantro sprigs and lemon wedges and serve immediately. MAKE AHEAD: Assemble the vegetables, chickpeas and olives in the bottom of the slow cooker. Brown the chicken thighs and place on top. Refrigerate until you're ready to cook it. We love Morrocan flavors in my house! I love making them and when I can use the slow cooker, even better! This is such a flavorful dish and you have really showcased the Morracan spices! I love the Progressive Eats that you have put together with some of my favorite food bloggers! Delicious recipes by the best! Thanks, Eileen! Yes, it’s a fun project each month! I made this last night and it was sensational, my guests really enjoyed it!! Thanks, Claire! So glad you all enjoyed! This is such a lovely and comforting dish with all my favorite flavors and proteins. What a great main course – it will be a huge hit in our house. Moroccan flavors are some of my favorites! I love how this dish sounds and looks. I’m certain that I need a tagine now. 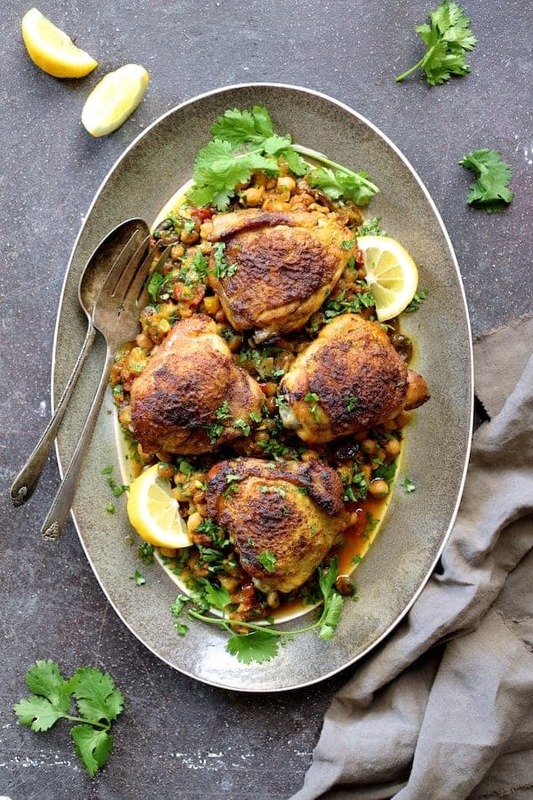 My husband and I both love Moroccan flavors and this dish will definitely be on my to make list soon! Beautiful photos and a great recipe to try!! Hi, Jane, Thanks so much and hope you enjoy! It’s so easy and has so much flavor! This looks like the perfect weeknight meal. So flavorful and healthy, yet simple. I bet I could put together most of it the night before and then enjoy the results (and the smell wafting out of the slow cooker) the next day. Yum!! Hi, Laura, It’s super easy to pull together the night before. Just get everything assembled and the chicken browned and refrigerate until you want to cook it. That’s it! Ooooh, This looks amazing. I love that you can make it in the slow cooker. It definitely make me look like a super hero! Hi, Karen, Thanks so much and it’s super easy! I love these Middle Eastern flavors! What a marvelous dish for a chilly autumn night!